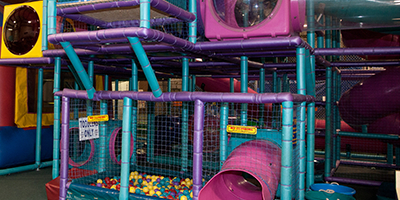 Cluggy's is your place for family fun! We are open year-round and would love to see you in the near future. Please feel free to call us at (717) 267-3772 if you have any questions or need help finding us. We're easy to get to, just off Walker Road in Chambersburg, PA.
Cluggy's is located just a half mile off exit 16 or 17 of Interstate 81 in Chambersburg, Pennsylvania. We are located along Walker road and our entrence is on Bedington Blvd. I-81 South to exit 17. Right on Walker. Straight through light. Right onto Bedington Blvd. Make right into Cluggy's. Drive through downtown Chambersburg until Queen Street (US 30 West) merges into Lincoln Way East (US30 East/West). At the third traffic light, turn left on Walker Road, between Long John Silvers and Ruby Tuesday. In half a mile, turn left on Bedington. Go under Interstate 81. At the first traffic light, turn right onto Walker Road, between Ruby Tuesday and Long John Silvers. In half a mile, turn left on Bedington. We're easy to get to from Interstate 81 and US 30. Give us a call if you need any help finding us! We have fun activities indoors and out!